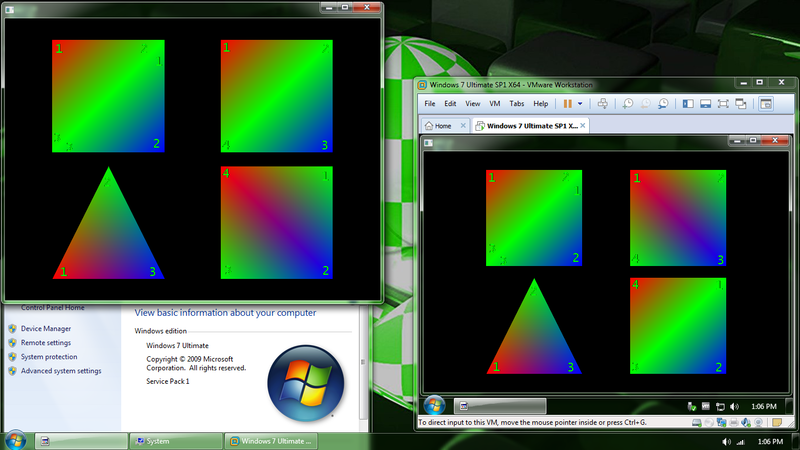 Re: why colored opengl quads behaves differently in virtual machines? A while ago I wrote an example for my little nephew. He wanted to experiment with OpenGL and Masm. Wrote some basic routine in one program. Background picture, transparent Bitmap font and a simple line draw function. About the gouraud shade colors in quads on virtual machines, I have no idea. The OpenGL implementation is free to split quads into triangles any way it prefers, or not split them at all if it supports directly rasterizing quads. In this case your VM's OpenGL implementation happens to choose to split your quads in a different way than your native graphics card driver. If you want consistent results across different implementations, stick to triangles.